Standing in Hongshan Park, Red Mountain is located at the heart of Urumqi. It is named after the reddish-brown color of the mountain. Its purple-red sandstone is deposited in the precontinental environment about 250 million years ago. Due to its historical and cultural background, the mountain is considered to be a symbol of Urumqi. 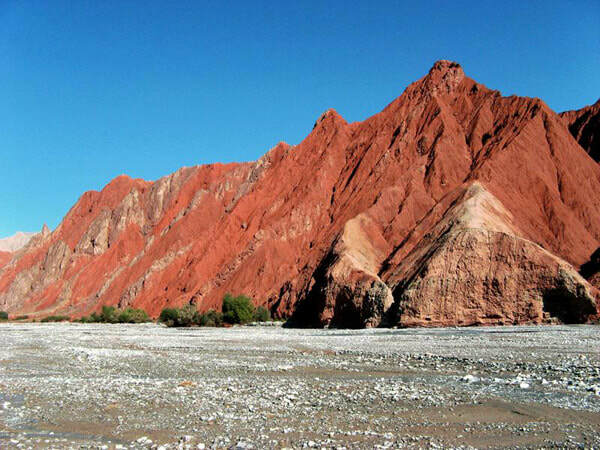 With a width of some 1 kilometer, Red Mountain lies from west to east for 1.5 kilometers long in Hongshan Park. The mountain offers a great chance to enjoy the amazing panoramic views of the whole city from the Overlooking Building on the top. With the Qing Dynasty style, the building is 21.95 meters tall. It is located at the highest pointed on the mountain. In the mountainside behind the Overlooking Building is a cave called the Red Mountain Underground Palace. This winding cave was an air-raid shelter in the 1950s. It is 460 meters long. You could just walk in the woods, listening to birds’ singing, exploring the old temple, the 200-year-old pagoda and the waterfalls on the mountain. Originally built in the Qing Dynasty (1644 - 1912), the Hongshan Pagoda in the west of the top is well-preserved through several earthquakes in history. Or if interested, you can go boating on the lake in summer. If you want to take a rest during the visit, you could sit in a pavilion or just sit on a stone under the tree. The mountain is home to more than 70 species of trees. If you are planning to visit Red Mountain for photography purposes, the best time to visit is during the sunset. Take Bus 29, 35, 61, 62, 63, 73, 908, 58, 927 and Bus 919 to the Stop of Hongshan Park (红山公园站). As at 27th December 2018, it is free to visit the mountain. If you want to enter the Hongshan Pagoda, the admission fee is 10 CNY per person. Please take enough food with drinking water with you. Please wear the sunscreen cream, sunglasses and the like as it is dry in Urumqi. Interested in visiting Red Mountain on a Tour? Wendy Wei Tours offers a variety of different packaged tours as well as custom tours including Red Mountain, among other attractions and destinations. To find out more, please visit our Tours page or Contact Us directly to find out more.